As 2017 rapidly draws to a close, the nights have gotten cooler in southern Georgia, with some semblance of winter arriving in the not so distant future. For reptiles and amphibians, shortening day lengths and the arrival of cooler weather signal a shift in behavior and a need to find winter refugia. Reptiles and amphibians are ectotherms, which means that they obtain the energy necessary for normal activities from the sun either directly (basking) or indirectly (resting on a warm surface). Endotherms (e.g., mammals and birds), on the other hand, are capable of generating their own body heat by metabolizing compounds in the food they consume. Ectothermy affects all aspects of reptile and amphibian biology, but it is particularly important when energy from the sun becomes scarce. Skink buried in a small hole under a log on a chilly fall day. Many reptile and amphibian species in Georgia’s Coastal Plain begin a months-long period of reduced activity or even complete dormancy as winter approaches. Underground retreats are a common method for sheltering from the cold but some species also utilize spaces in trees or rocks. During the coldest portion of the winter individuals may remain in the same location without moving or feeding for several weeks or months, surviving on fat stores built up over the long summer. For example, some of the native skink species (genus Plestiodon) aggregate in hibernation sites when temperatures are low. Gopher Tortoises (Gopherus polyphemus) exhibit reduced activity during the colder months, only leaving their burrows on days that are warm enough to permit activity. Tortoise burrows also provide a convenient shelter for many other species because they remain at a relatively constant temperature throughout the winter. Although most amphibian and reptile species are less active during the winter, there are exceptions. The winter months are a critical time of the year for Eastern Indigo Snakes (Drymarchon couperi). Beginning in late October or early November, Indigo Snakes move from surrounding habitats towards sandhills that are populated with Gopher Tortoise burrows. These sandhills serve as mating grounds for Indigo Snakes, where males compete with one another for access to mates. Competing males will intertwine their bodies and wrestle with one another for superiority. Mating on sandhills with tortoise burrows presents Indigo Snakes with easy access to refugia during nights and cold days. Indigo Snakes often emerge from tortoise burrows in the morning and bask in the sun near the burrow entrance before moving off to forage or search for mates. Snakes remain on sandhills until late February or early March before dispersing back into surrounding habitats. The winter Indigo Snake breeding period marks an important time of year for our population monitoring and research. It is difficult if not impossible to effectively monitor species when they cannot be reliably observed or captured. During the spring and summer, it is almost unheard of to encounter Indigo Snakes, and there is no reliable method for locating them. However, when snakes are concentrated on sandhills they can be surveyed effectively via visual encounter surveys. These surveys allow us to track site occupancy (are snakes present or absent) through time and to mark individual snakes in case they are recaptured during a subsequent survey. 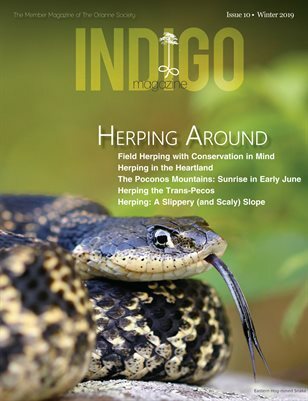 Thus, even though cold weather generally lowers reptile and amphibian activity, it is a crucial time for Indigo Snakes and for conservation efforts with this incredible species.